Part 1 sounds great. I am looking forward to it. When are they planning to release parts 2 through 143? This looks like such an amazing tool and resource. If anyone that reads this and knows me, my birthday is coming up soon...hint, hint. Wow, awesome. Thanks for posting Irene. GM, thanks for taking the time to do the video! This video is absolutely amazing, this blog is great too, thank you Irene for posting such great information and news. This looks fantastic! Does anyone know what the running time for part 1 is? Its one hour long. Part two will also be about an hour...I;m not sure when it releases. Irene, this demo is really incredible. Thanks for posting! Thanks for posting this irene, what amazes me is that the few times i've had the pleasure to watch greg work, i've noticed he talks about painting unlike anyone else i've known or studied under. He's really great to watch. Great post Irene. I was lucky enough to see Greg in Seattle during Revelations and he had so much great knowledge to share. Same with Dan Dos Santos. They seemed like really great guys. I'm definitely getting this. Do you know if Dan is coming out with a video anytime soon? I can watch this all day long. Greg has a real talent for connecting to the viewer and he of course is an unbelievable artist. Thanks so much for posting. Wow - I didn't even know this was coming. What a treat! Greg is so full of awesome. Bought it immediately after I saw the message here. very nice man indeed. He paints with such a relaxed attitude, constantly stepping back and watching where the image takes him. Oh yes, now I want to be a ninja too! Thanks Irene! 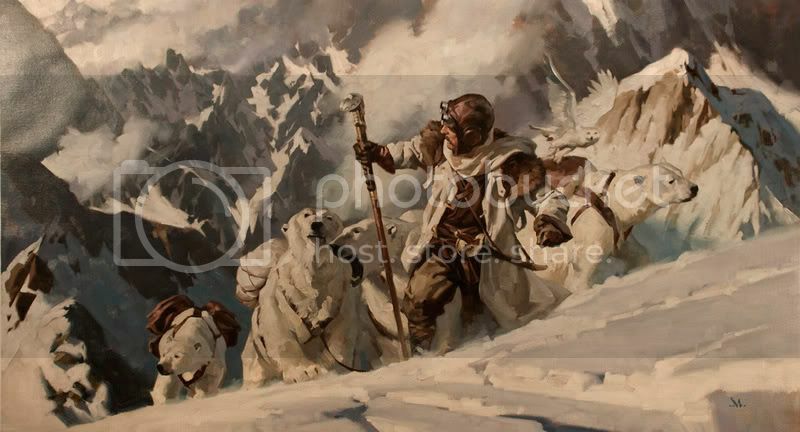 Manchess is a painterly-painting GOD! Thanks, you all, for watching and listening to me drone on about my painting. If you have the stamina to listen, I'll keep the work going, and try to get better at speaking at the same time I'm working. It's an odd endeavor, but it keeps me...real. Your comments touch me deeply, as I felt a responsibility to talk honestly about my painting process. No BS. Just straight up, direct action, from idea to finished work. I'm excited by your enthusiasm here! This will help me explore. Thank you for that. And thanks to Irene for the post!